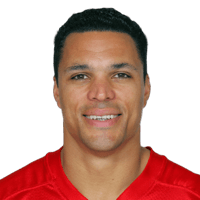 Published: Dec. 24, 2013 at 12:00 a.m.
Atlanta Falcons tight end Tony Gonzalez goes airborne and brings down a 2-yard touchdown reception. Published: Dec. 16, 2013 at 02:52 a.m.
(3:58) (Shotgun) M.Ryan pass short middle to T.Gonzalez for 13 yards, TOUCHDOWN. Published: Dec. 15, 2013 at 01:36 p.m.
Atlanta Falcons quarterback Matt Ryan connects with tight end Tony Gonzalez on a 13-yard touchdown pass in the first quarter. Published: Dec. 9, 2013 at 03:12 a.m.
(8:48) M.Ryan pass short right to T.Gonzalez for 2 yards, TOUCHDOWN.